Inspired by the automotive industry, the Serenity’s curved fiberglass body construction is designed for strength and durability. 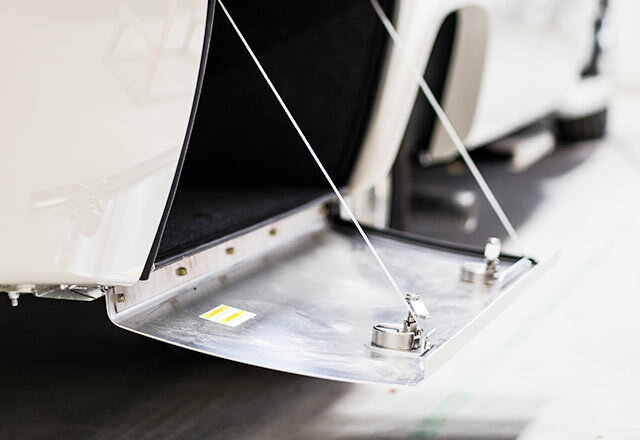 Built on the Mercedes Sprinter Cab Chassis, the sleek aerodynamic exterior lines diminish wind noise and boost fuel economy. The end result is one of the most beautiful and unique Class B+ RVs on the road today. Freedom awaits in the 2018 Serenity. Your home on the road. The Serenity boasts a blend of functionality and elegance. Separate living areas including a spacious kitchen, a comfortable dining area, and an optional rear power sofa-bed create spacious areas for any time of the day. Beautiful curved solid wood cabinetry in your choice of Chestnut Cherry, Sierra Maple, or Espresso Brown finishes bring the comforts of home to the open road. 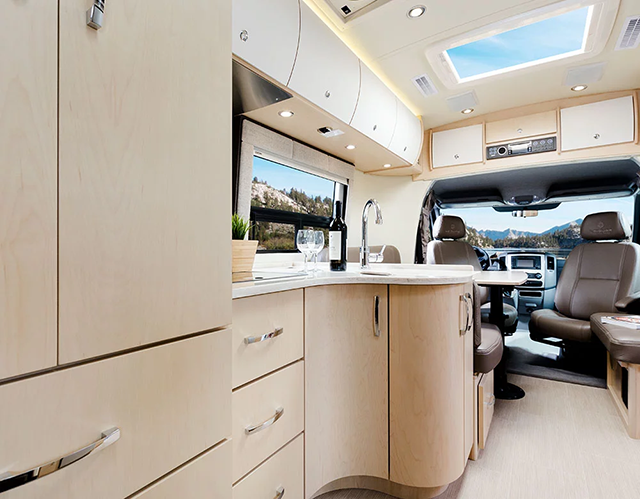 From the spacious galley with a pullout pantry to the enclosed fiberglass shower, each and every corner of the Serenity has been cleverly utilized–it feels so roomy, you won’t believe you’re in a 24’6″ small motorhome! 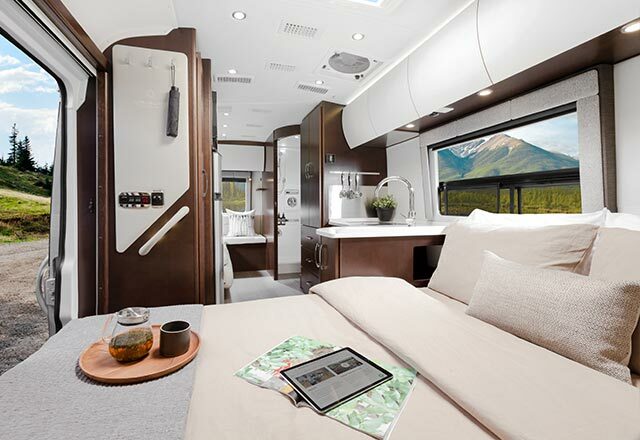 From handcrafted solid wood cabinetry to French-seamed upholstery, every detail has been carefully planned and masterfully executed in the Serenity Class C luxury RV. Powered by the Mercedes-Benz Sprinter. An impressive feat of German Engineering, the Mercedes-Benz 3500 Sprinter Cab Chassis is the perfect fit for the 2018 Serenity by Leisure Travel Vans. With its 3L V6 BlueTEC diesel engine under the hood, you’ll enjoy a smooth yet powerful ride with class leading fuel economy estimated at 16-18MPG. Setting a new standard in protection, the Serenity now comes standard with Bi-Xenon Headlamps, High Beam Assist, Collision Prevention Assist, Lane Keeping Assist and more. See the full list of Sprinter upgrades. Inspired by the latest automotive advances, the Serenity’s molded curved fiberglass body is designed for strength, durability and fuel efficiency. Sleek, aerodynamic exterior lines minimize wind noise and make the Serenity one of the most beautiful Class C RVs on the road today. From handcrafted solid wood cabinetry to French-seamed upholstery, every finish in the Serenity has been carefully planned and masterfully executed. 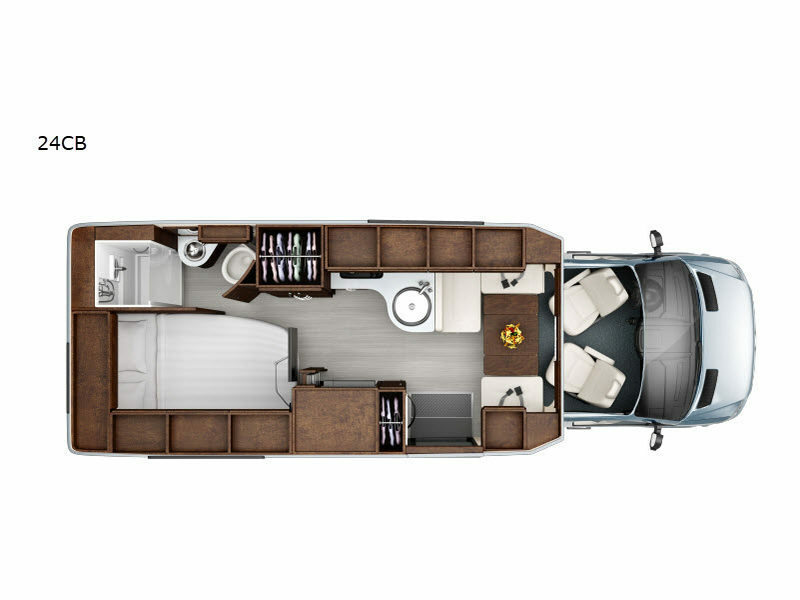 And, with a wide variety of cabinetry and decor options available, you can customize the Serenity to suit your unique style. 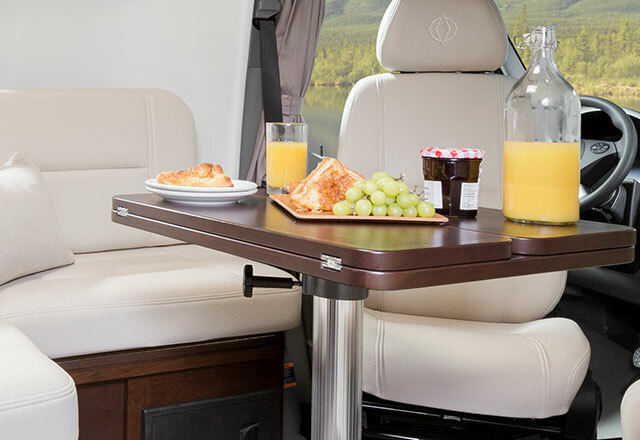 At Leisure Travel Vans, we want you to feel at home no matter where your journey may lead you. Whether you choose the rich luster of Chestnut Cherry, Espresso Brown or the contemporary European style of Sierra Maple, the Serenity’s solid wood curved cabinetry offers seemingly infinite storage with unwavering style and quality. To maximize comfort and make the most out of every inch of space, the Serenity’s floorplan features two flexible living spaces. In the rear of the coach, the optional power sofa converts to a bed at the touch of a button. Up front the dinette converts to form a second bed for guests. The Serenity’s large side entry door provides easy access. Frameless tinted glass windows look great, are resistant to scratching and open awning-style, allowing you to let fresh air in while keeping the rain out. European-inspired automotive-style fiberglass front and rear masks create a sporty and integrated look. The curved aluminum baggage doors on the Serenity feature flush-mounted stainless steel locks. LTV’s full-body automotive paint process consists of three coats of color and two coats of clear.